In 2007, four fatalities involved dogs from two different breeds, thus producing a death count total of 39, rather than 35. Six dog breeds each contributed to one death: husky, mastiff-mix, wolf-dog hybrid, doberman pinscher, golden retriever and Welsh corgi. The combination of pit bulls (21), rottweilers (4) and American bulldogs (3) accounted for 80% (28) of the attacks resulting in human death in 2007. 51% (18) of the fatality victims were children, 11-years and younger, and 49% (17) were adults, 21-years and older. Of the adult victims, 76% were ages 55 and older. 31% (11) of all victims were either visiting or living temporarily with the dog's owner when the fatal attack occurred. 64% (7) of these victims involved young children. 49% (17) of all fatal attacks involved more than one dog; 14% (5) involved a pack attack of 4 or more dogs. 23% (8) of all dog bite fatalities involved chained dogs. 77% (27) of all fatalities occurred on the dog owner's property and 23% (8) off-property. 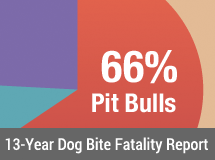 Of the total off-property dog bite fatalities, 63% (5) involved pit bulls. In 2007, 60% (21) of all fatality victims were female and 40% of the victims were male. Of the female victims, nearly half (10) were ages 55-years and older. 29% (10) of all deaths resulted in criminal charges; 60% (6) of these cases involved pit bulls. Michigan filed charges in one attack that involved a double fatal mauling. The state of Texas had the most dog bite-related fatalities (7), followed by Georgia and Tennessee each with 4 deaths. Florida and Michigan each incurred 3 deaths. DogsBite.org first became aware of the dispute regarding James Chapple's death in 2012. We published about this dispute in 2013. In late 2016, we obtained a copy of his autopsy report. His death remains an open dispute because there is no information on his baseline health prior to the attack and we have no information about what was included in his hospital discharge records. This information would help determine if Chapple showed "failure to thrive" after the dog mauling. Given HIPPA laws, obtaining either would be impossible for any nonprofit organization. Change Log: In June 2015, the 2007 Dog Bite Fatality statistics were reissued with the following changes: Amber Jones was reclassified as an off-property attack with "unknown" in terms of chaining, and a Welsh corgi was added to the fatal attack of Carshena Benjamin. The catahoula-pit bull mix and catahoula-bulldog mix is a hybrid hunting breed built upon pit bull crossings. It is not recognized by established kennel clubs, such as the AKC and UKC.